I'm a little late with this challenge, but better late then never right? 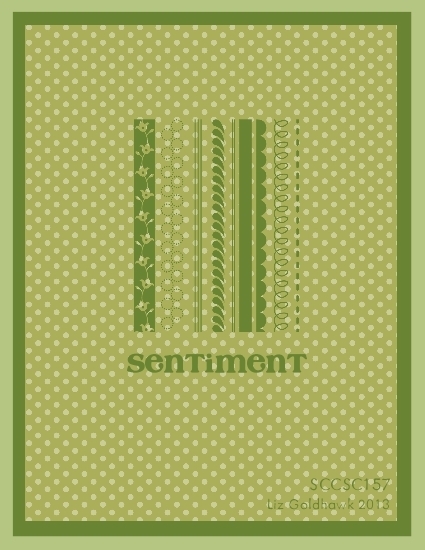 I combined this challenge with the SCCSC157 sketch challenge on Stampin Connection to knock two challenges out at once. Take a look! Make a project "using your Markers (thumping,Color Spritzing,Coloring etc.)". Or Make a project with "Texture". Or "Mash it Up" and create a project with "Texture using your Markers". I started off by cutting a piece of Pool Party card stock 5-1/2” x 8-1/2” and scored it at 4-1/4”. Next I cut a piece of Calypso Coral card stock 3-3/4” x 5” and a piece of Whisper White card stock 3-5/8” x 4-7/8”. I stamped the leaf image from Secret Garden onto the center of the Whisper White card stock in Lucky Limeade ink, and the small solid blossom image from Secret Garden in Pool Party ink. Next I stamped the greeting from Delightful Dozen in Calypso Coral ink below the leaves and flowers. I ran this piece of card stock through the Big Shot in the Honeycomb embossing folder. I sponged around the edges of the panel with Pool Party ink then adhered the card stock onto the Calypso Coral card stock. I wrapped a piece of Pool Party ribbon around the panel and tied it into a knot. This is some of the ribbon in the Sycamore Street Ribbon and Button pack that you can get for FREE during Sale-A-Bration, and it is gorgeous! I adhered the panel onto the card front with Stampin’ Dimensionals. I stamped the large flower image from Secret Garden onto a scrap of Whisper White card stock in Black Stazon ink. Coloring in the flower took several steps. First I squeezed the center of the closed Calypso Coral and Primrose Petals ink pads and opened them half-way. I used my Blender pen to pick up a little bit of Calypso coral and colored in every other section of petal. Then I picked up a little bit of Primrose Petal ink and colored in the remaining petal sections. At this point you have a very light colored flower. Next I used the Calypso Coral and Primrose Petals markers to color on the respective petal sections about 2/3 the way down the length of each petal. Then I used Tangerine Tango on the Calypso Coral sections and Rose Red on the Primrose Petals sections to color about 1/2 way down the length of the petals. I went over the petals one more time with the Tangerine Tango and Rose Red marker only coloring about 1/4 way down the length of the petal this time. Finally I colored over the entire thing with just the Blender pen with no ink to blend the colors a little bit better. 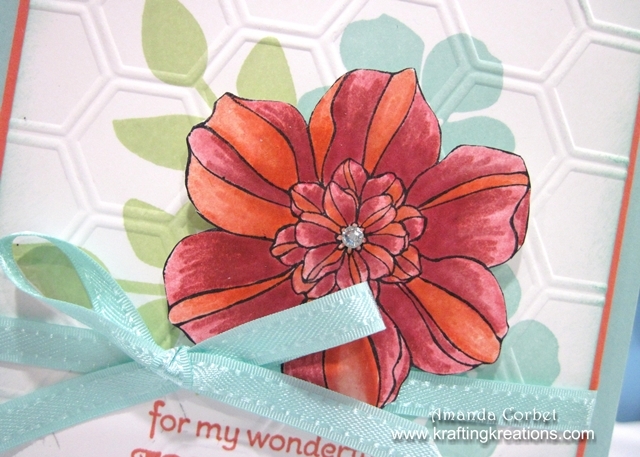 I cut out the flower with Paper Snips and adhered it onto the card front with a Stampin’ Dimensional. Then I added a small Rhinestone into the center of the flower just to add a little bit of sparkle! 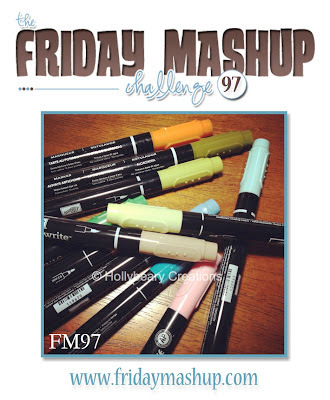 If you have a chance head on over to The Friday Mashup to see what the rest of the design team created! I hope you get a chance to play along!